You've matched wits with Malkavians and done business with Ventrue. You've survived the soirees of the Nosferatu and the dungeons of the Tzimisce. 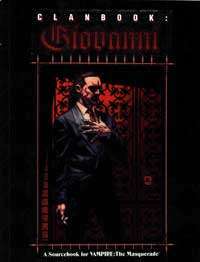 Now, in this final clanbook, descend into the nightmare crypts of the incestuous Giovanni. ...It's an offer you just can't refuse. Baptized in blood and treachery, this sinister clan of necromancers worms its way through the Jyhad while feigning noninvolvment. Wheter gutting companies or animating corpses, the Giovanni is a power to be reckoned with. Discover the bloody legacy of these insular undead, and their even deadlier future. The history of the clan, and the revelation of its ultimate goals. Information on the Giovanni's dealings with mortals... and wraiths. New Merits, Flaws, and Necromancy powers.